Beautiful and thought provoking! Thanks Lisa for this amazing inspiration! To create the base to my layout, I used corrugated cardboard in 2 layers for the base. For the top layer, I peeled back and distressed the paper. Spritzing it with water helps with the process. I stamped the sentiment on a piece of paper from the same collection I used to create the entire layout. I used a brown ink and then cut the sentiment in strips. I inked the edges of the strips, then adhered it to my layout. 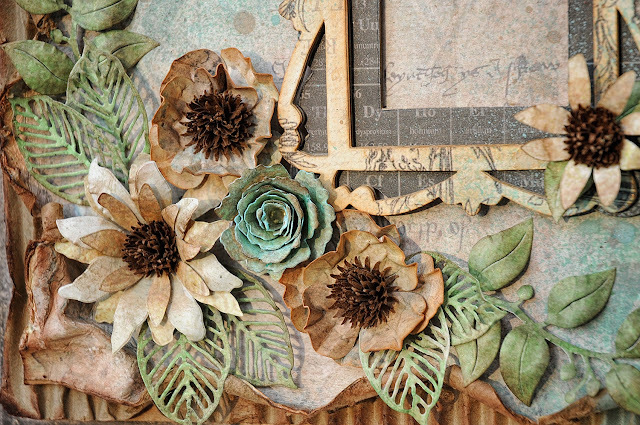 All of the flowers on this layout were created from various dies in my stash. Prima, Sizzix, LaLa land Craft, and Spellbinders are some of the brands I used. I also used a Sun McGill punch for my flower middles. I layered about 6 pieces for each middle to make them look like dried up thistle flower pods. 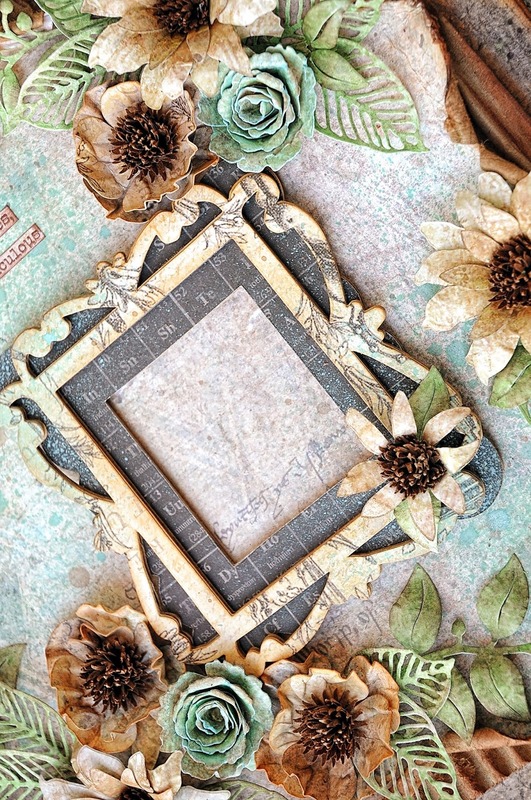 The frame was created from 2 different Sizzix dies. I just layered them to make it a bit dimensional. I cut a base from corrugated cardboard then cut the same 2 designs with paper. I adhered the paper to the cardboard then layered the 2 pieces and inked the edges. This created a dimensional frame. Here is a closeup of some of the flowers. 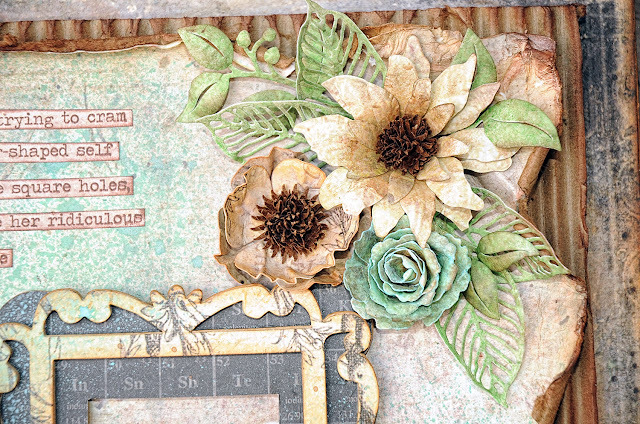 I spayed them with Lindy's Stamp Gang Spray and inked everything on the layout using Tim Holtz Distress ink. I love that the ink is water soluble and will spread if wet. It worked beautifully on this layout. 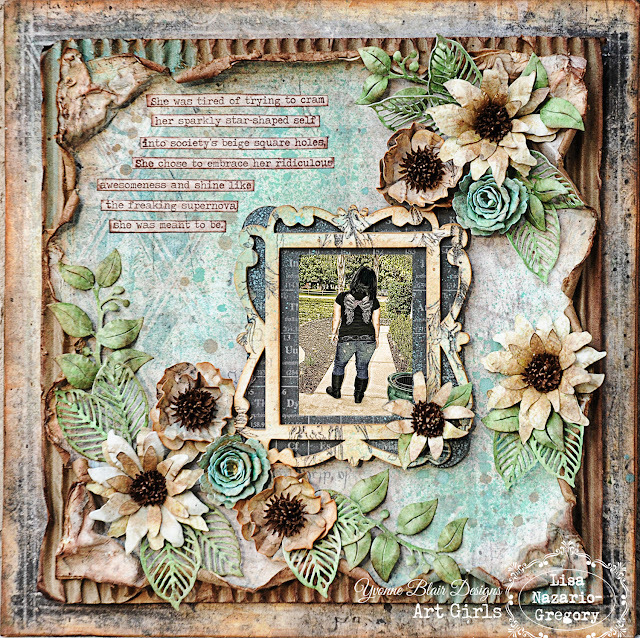 So many dimensions of beautiful..... Lisa's work of art, the story of her daughter that inspired to create this, and the perfect sentiment on Yvonne's stamp. Beautiful. Great execution of a great sentiment. I am sure your daughter really appreciated it.